To my friends in Ontario. This year's Sankey Lecture will be presented by Dr. Andrew Prescott. Dr. Prescott will be presenting Searching for the Apple Tree: What Happened in 1716? - work that he has done jointly with Dr. Susan M. Sommers Professor of History, Saint Vincent College in Latrobe, Pennsylvania. Dr. Sommers was the 2015 Sankey Lecturer. 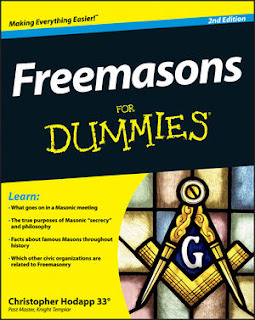 They will be looking at the history of the Apple Tree Tavern in Covent Garden, where the first meetings that led to the formation of the Grand Lodge in London were supposedly held. Dr. Andrew Prescott, FSA, FRHistS, is the Professor of Digital Humanities, AHRC Theme Leader Fellow for Digital Transformations, of the University of Glasgow. There is NO CHARGE for attending the event, but TICKETS ARE required. 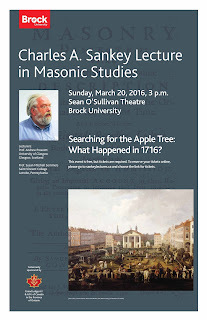 Tickets for the March 20, 2016 Sankey Lecture are now available from THIS WEBSITE. 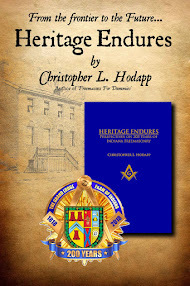 This program is sponsored by the Grand Lodge of Canada in the Province of Ontario.